Thursday’s loss to the Maple Leafs was really more bad fortune than poor play for the Sabres. Robin Lehner played a strong game in goal only to see his performance eclipsed by Frederik Andersen’s 42-save gem. 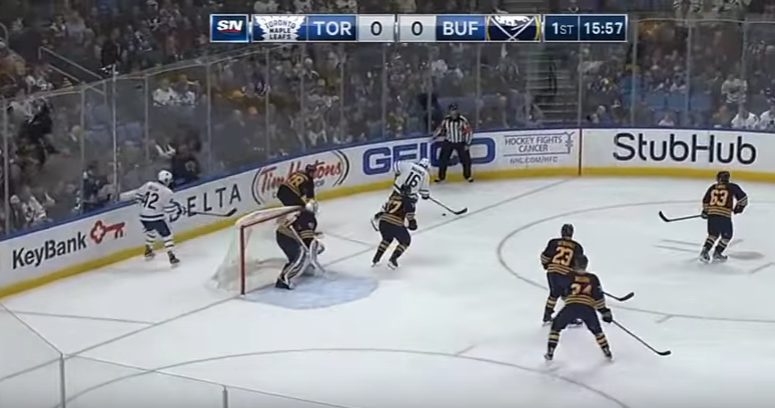 Buffalo poured scoring chances on the Leafs goal only to see Andersen make a number of highlight reel saves – none better than his left pad robbery of Zemgus Girgensons. The two goaltenders combined for 70 saves in total as Lehner kept his team in the game for the full 60 minutes while Andersen basically took two points from the Sabres all on his own. It wasn’t all that much different than Buffalo’s 2-1 loss to Vancouver in October when the Sabres simply couldn’t solve Jacob Markstrom. It may be more beneficial to break down one of Andersen’s numerous dazzling saves as he turned in a truly impressive technical performance. Early in the year, Andersen appeared to be playing well outside of his comfort zone but he was in peak form on Thursday. Lehner’s play was without merit either. In a game where his team dominated, Buffalo’s goaltender didn’t let his squad down. It would have been very easy for Lehner to allow a goal or two more, leaving the game well out of reach for the Sabres. The one play I chose to take a closer look at was the first Leafs goal where Mitch Marner beat Dmitri Kulikov and Lehner to the far post to open the scoring. It was a goal where Lehner had very little chance to make the save, although it seems to me that he didn’t make the best possible choice either. The play itself really unraveled early on as Zemgus Girgensons lost the puck in behind the net where Marner was able to exploit both Girgensons and Dmitri Kulikov off the loose puck. AsTyler Bozak poked the puck to the corner, Girgensons pursues momentarily as does Kuilkov, sticking with his man. This lapse by Girgensons gives Bozak room to create as Marner reverses the play back behind the net. It’s enough space for Bozak to either try for a quick jam at the side of the net or to pull the puck out and survey his options. Marner swings the puck behind the net and continues his momentum up around the faceoff circle. Kuilkov will remain on his hip, as he should, but Buffalo’s entire defensive shape looks out of sorts as the puck is reversed behind the net. Girgensons is well off Bozak while Casey Nelson is rather high in the slot considering Bozak’s position. This is possibly because the Sabres were beginning their breakout as Girgensons picked up the puck behind the net. Girgensons is sill in a heap of trouble as Bozak gets the puck and Lehner has reacted to the threat of a stuff attempt by sealing the ice on the short side. 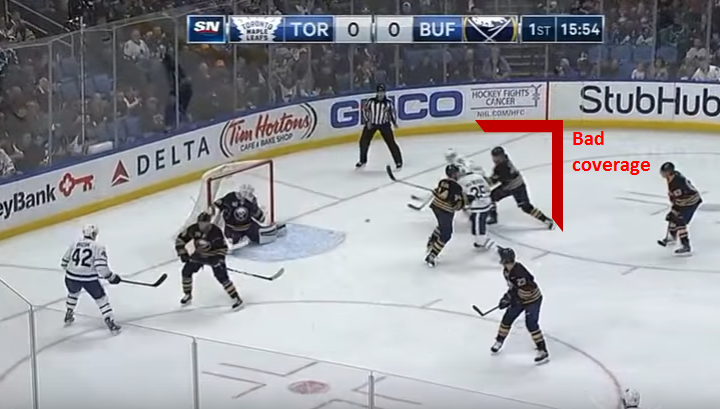 This is something Marty Biron highlighted on the broadcast as well, but Lehner does a good job here of identifying the only option the puck carrier appears to have. Considering there are no Leafs below the hashmarks and there are four Sabres in relatively good defensive position, this is the right read on Lehner’s part. Through this entire play, Kuilkov manages to keep solid positioning on Marner as they move back to the crease. 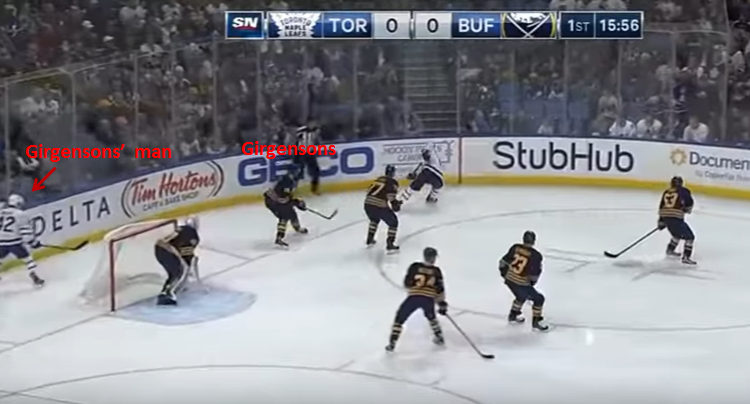 Girgensons still hasn’t managed to close the gap on Bozak which allowed the Maple Leafs center to thread an uncontested pass to Marner on the back post. Marner eventually toasts Kulikov and Lehner is victimized for playing a little too vertically on Bozak’s chance on the near post. Ideally, Kulikov maintains body position on Marner and the puck winds up in the corner for Ennis to retrieve and breakout. The one thing Lehner could have done was respect Bozak as a passer a bit more. Rather than remaining in a full butterfly on his post, playing in an RVH set up would have allowed him to get his left pad extended quicker as the puck came across the crease. Bozak never proceeded past the bottom of the circle, so despite his early read, Lehner probably needed to respect the pass a bit more. That’s not to say this is a weak goal. Hardly. It’s a very well executed play by Bozak and Marner and some poor coverage from Kuiklov and Girgensons. Marner’s second goal was similar in a way as another giveaway behind the net allowed Marner to break to the net late and score the winning goal. Neither goal really sits on Lehner in terms of responsibility as lapses in coverage served as the biggest issues on each play.